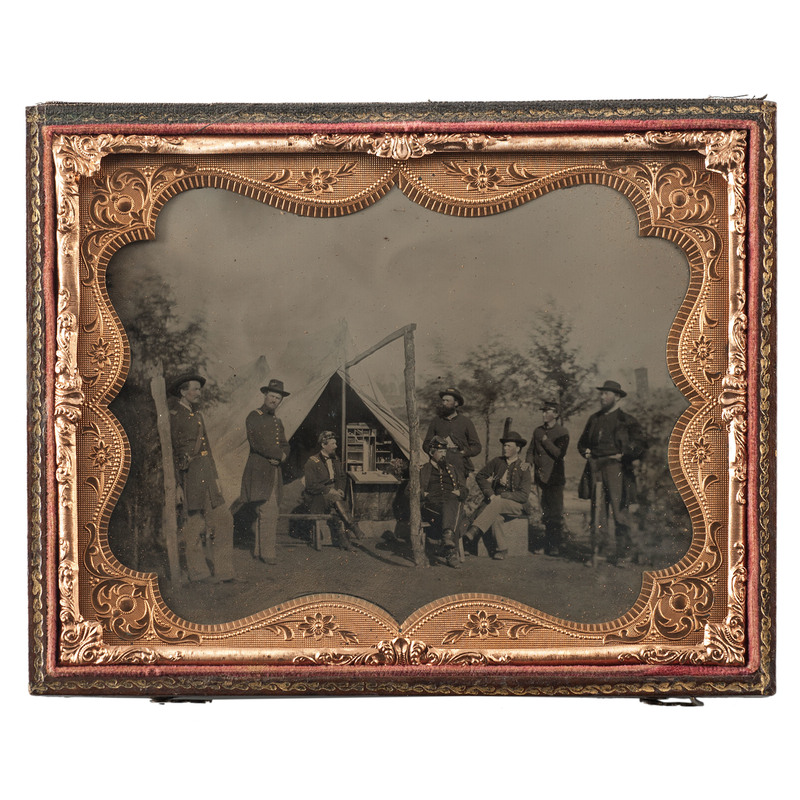 Anonymous, half plate tintype featuring officers and enlisted men of the 38th Indiana Infantry, taken around Murfreesboro, TN in April of 1863, while the 38th was encamped there following the Battle of Stones River. 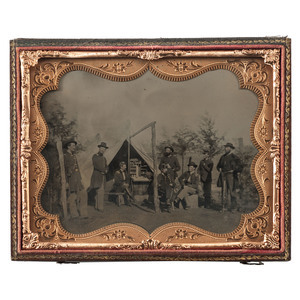 This spectacular outdoor image shows the men gathered around an open tent, with a captain's desk figuring prominently in the scene. Image housed in a full pressed paper case, fully separated at spine. 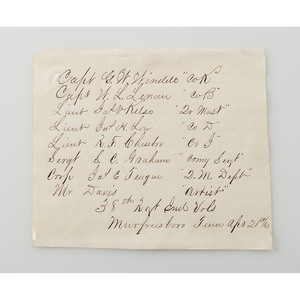 Accompanying period label with embossed maker's mark identifies all of the subjects, including Captain George Windell of Co. K, Captain William Leneau of Co. B, and Lieutenant James Low of Co. D. At the time this image was made, it is likely that Low had recently returned to the regiment after recovering from a serious head would received at Stones River. Low eventually took command of the 38th, but was killed at the Battle of Bentonville, NC, before the official commission and subsequent promotion was received. Additional paperwork included with lot provides more detailed biographical information of each subject, referencing official reports, company histories, and post-war memoirs. The 38th Indiana saw extensive service in the western theater of the war, participating in over a dozen battles including Perryville, Stones River, Chickamauga, Chattanooga, Resaca, Kennesaw Mountain, Sherman's march, and Bentonville. 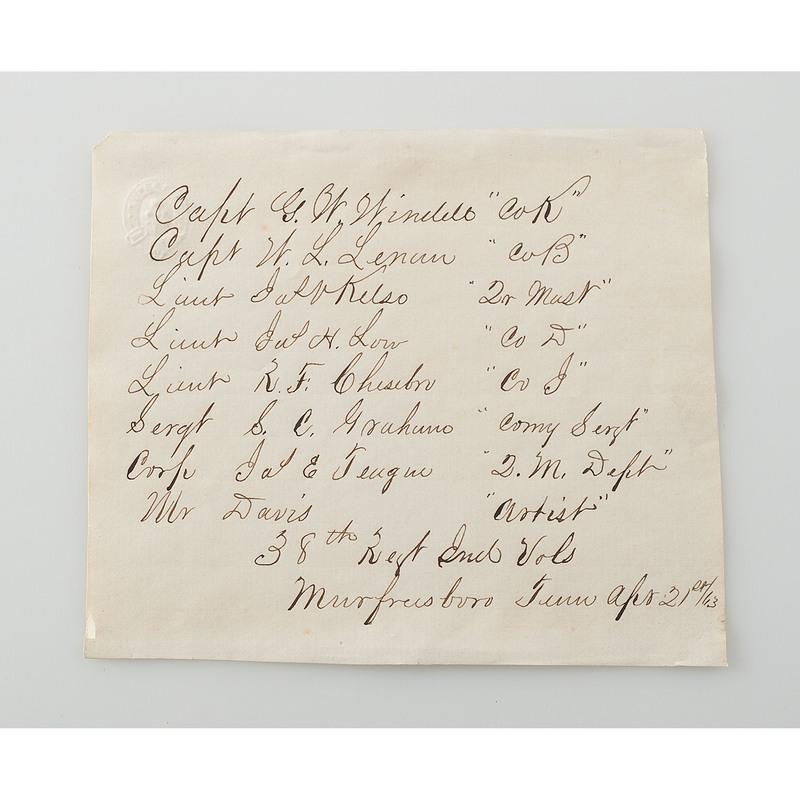 The regiment suffered heavy casualties during the conflict, losing over 400 men to combat and disease before mustering out of service in July of 1865. This photograph was published in Shadows of the Storm: Volume One of The Image of War 1861-1865, edited by William C. Davis and published by Doubleday & Company Inc., Garden City, NY, 1981 (p. 340). A fine image. Image in excellent condition, with great contrast and clarity, and no imperfections in the plate, with the exception of a very minor outline of the brass mat.